Ballinamallard United recorded a second consecutive 3-0 league win to move up to eighth in the table but it was an eighth consecutive Premiership defeat for struggling bottom side Warrenpoint. Michael McCrudden opened the scoring on 54 minutes when he forced the ball home from close range after Johnny Lafferty had sent his shot goalward. Liam Martin then blasted in his third of the week in the 72nd minute. Ryan Campbell slotted home in the 90th minute to complete a convincing win. Liam Bagnall had the first chance of the match after 15 minutes but he curled his effort wide of the post after good work by Daniel and Mark Hughes. Bagnall had another scoring opportunity soon after but Alvin Rouse parried his fierce shot and Stephen Hughes was unable to capitalise on the rebound. McCrudden found the net after Adam Lecky had headed on a Jason McCartney corner and the ball fell to McCartney following Lafferty's initial touch. Campbell saw an attempt soar over the bar for the Mallards and skipper Steve Feeney blasted over when well placed. The home side increased their advantage when Emmet Friars got his head to a looping cross and knocked the ball down into the path of Martin, who finished clinically. Lecky supplied the ball for Campbell to run through and add the third, leaving Warrenpoint still four points adrift at the foot of the table. 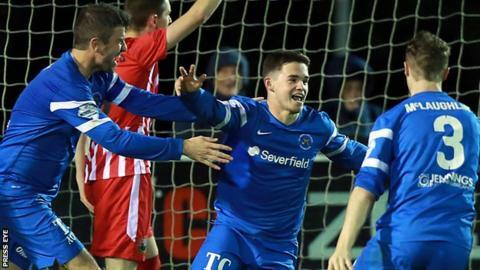 Warrenpoint manager Barry Gray: "The players are letting themselves and the club down. The team that played in the first half played to my instructions but the team that played in the second half played to their own plan. "I have been here for 11 years and have put in a lot of hard work. I think I have earned the right for them to put in the hard work too, and for them to follow the instructions I am giving."